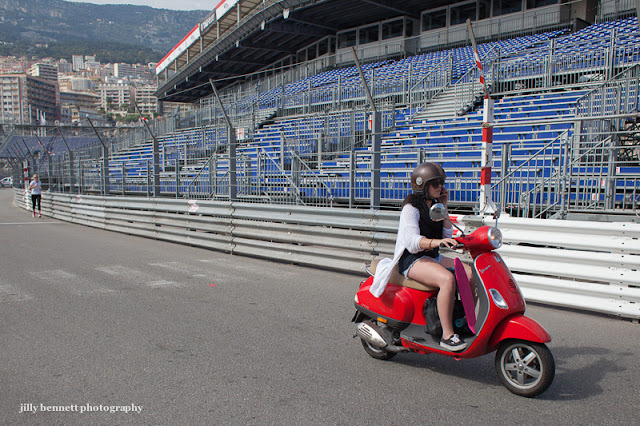 Monaco is wearing her usual mantle of steel as she prepares for the Monaco Grand Prix which takes place on the 26th May. Here you see the stand that faces the pit lane. Behind this stand is Port Hercule. We'll see a photo of the other side tomorrow. Do they let people drive around on the race course? That would b fun. Of course! The race course is/are the streets of Monaco! Dave and Leo, right, whenever I have a visitor we do the whole Grand Prix circuit with appropriate vroom vroom noises. the only difference is we go around casino square in the opposite direction to that of race day. Otherwise it's the same - just a bit slower .... !